There’s no doubt that summertime is consuming: farming, tending the Creamery, animals, visiting relatives. Projects had to be “pick-up and put-down-able,” easy to carry around, and look like you actually made some progress after an hour (which would be about the time most I’d have for a sitting). These parameters meant that tapestry wasn’t on the radar for the summer season. 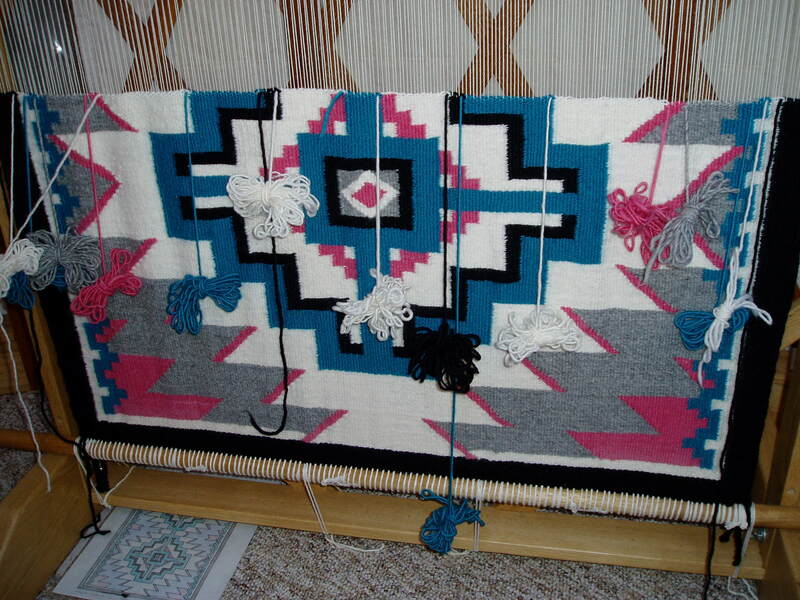 By autumn, I really was feeling the need to refocus in my textile work–spending cherished Sunday afternoons (my dedicated studio time) going back to my roots: Navajo tapestry weaving. The discipline, the precision, and measured, sweeping yet delicate movements, percussed by the pound-pound of the beater returned those long-learned rhythms, awakening them from the cellular level of memory. I was 13 when I first learned to warp and weave in the Navajo tradition, surrounded by a talkative tribe of grandmothers and my ever-patient teacher Fran Potter. I sat on the floor for this weaving, just as I had done with my first project…just as so many Navajo women have done for generations. I had also been making an effort to finish the score of partially-completed pieces about my studio and home. First a peacock-themed rug punch piece, then starting in on this tapestry, which had been languishing at the three-inch point for a couple of years. Poor thing! It’s the largest Navajo I had yet attempted–at least 30 inches wide by 45 inches high. Embracing a variation on the traditional “Two Gray Hills” theme, it also incorporates colors from Hope pottery–neighbors to the Navajo. It wasn’t until March that I felt I had given my roots enough time to regenerate, for my hands to retrain in the rhythms of technique, and my heart to settle from the turbulence of last year’s busy season, that I felt ready to re-engage with the Lady and the Unicorn “Deceiving the Hunters” piece. And this is what I found, with where I had left off last spring . I remembered why it felt to tremendously difficult to sit down and work on this tapestry once the demands of spring and summer had arrived. I had worked my way up to the lady’s face, endeavored through one eye, most of the nose, and the mouth, then had to stop. It’s a terrible place to have to stop and hope to pick it up again successfully. 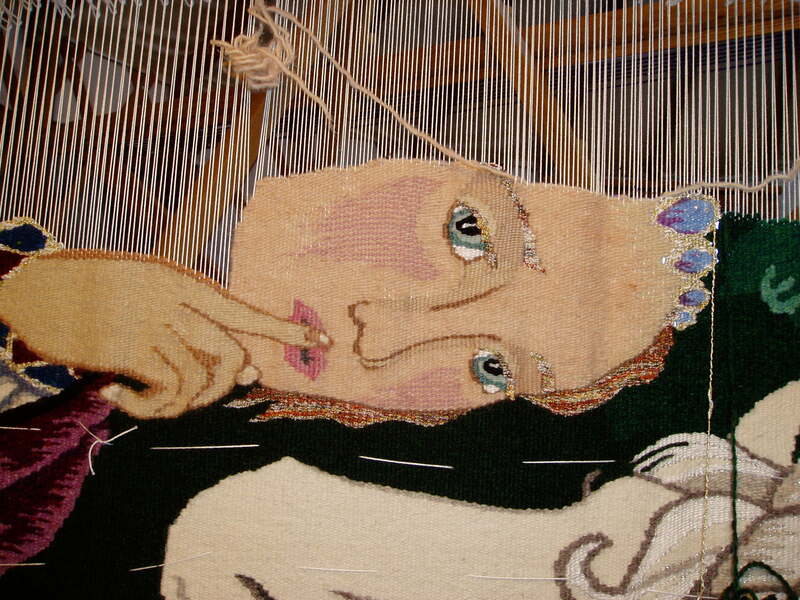 Faces are tremendously difficult to convincingly execute in tapestry. 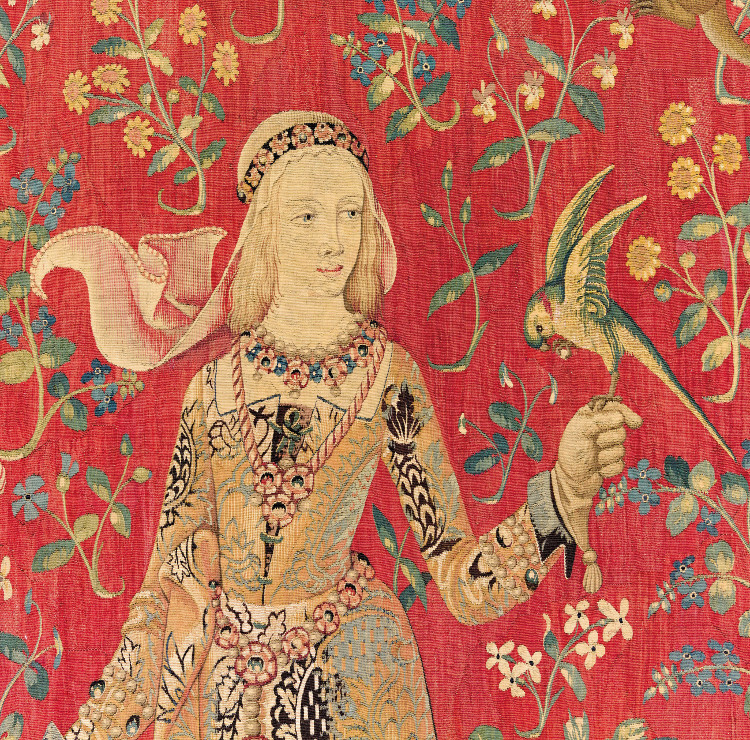 In the medieval studios, a master weaver or two would float from piece-to-piece, just doing hands and faces, while less-experienced weavers would create costume, flora, and fauna. Having hands and faces that were relatable, expressive, fluid, and believable were considered the most difficult element of the art form. 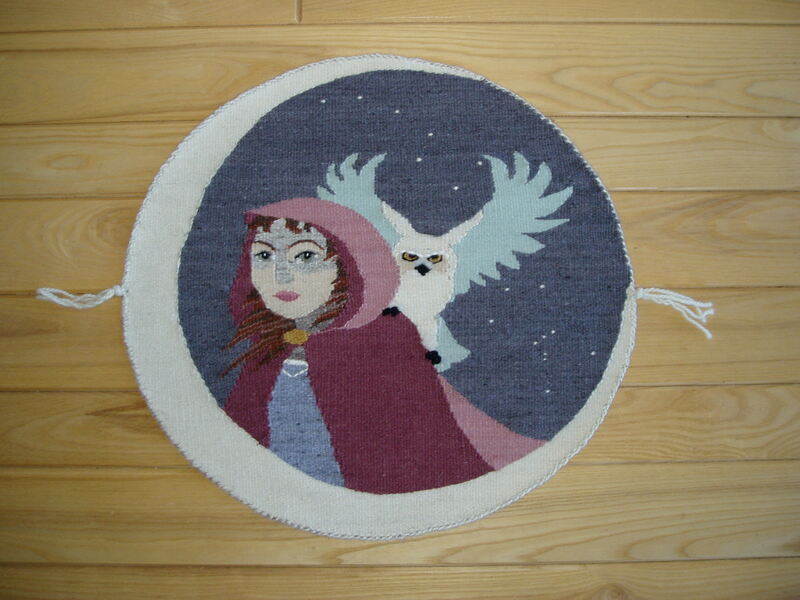 When I first started attempting faces in tapestry, daunting is a relatively mild word to express my feelings. 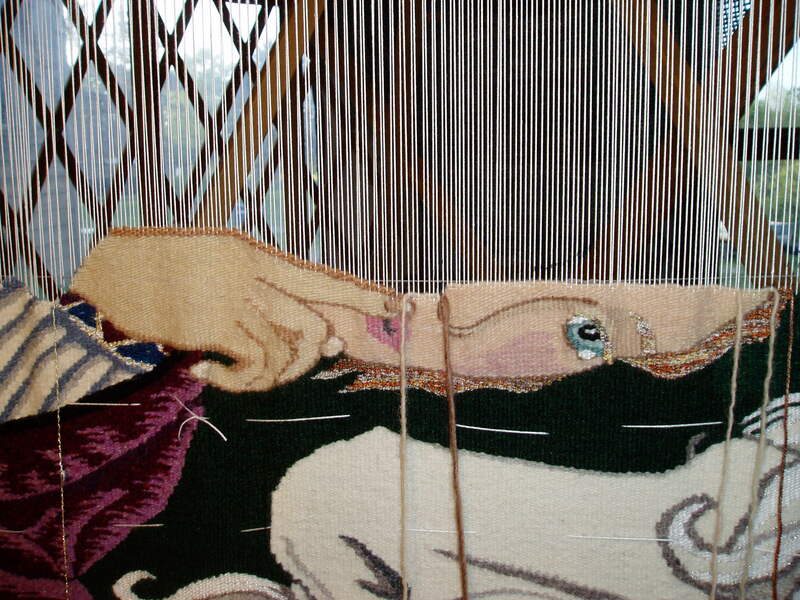 My original explorations into human figures in tapestry were on my Navajo round loom. “The Minstrel” was abstract, with experiments in shading the cheek and using outline. “Lady Winter” played with the idea of being lit from below (like when telling a scary story by flashlight), accentuating the cheek bones and above the eyes. Some of the details had to be added after the weaving process with a needle because the space used and the warp count couldn’t accommodate the desired affect within the weaving process alone. With “Nele and the Sea,” I opted to turn the face away from the viewer, with the greatest detail being her ear. The viewer could then add her own imagined details to the face, as the story felt fit. Maybe the figure could become someone she knew, or even herself. This choice also helped keep the movement of the piece towards the sunset, rather than fully resting on the figure. But in “Deceiving the Hunters,” a full face was necessary and unavoidable, cocked in the classic 3/4 tilt that is so prevalent in the era that inspired it. Profiles and straight-on faces in tapestry are much less common in the medieval and Renaissance period (and when they do appear, much less convincing in their proportions and placement of key elements such as eyes). 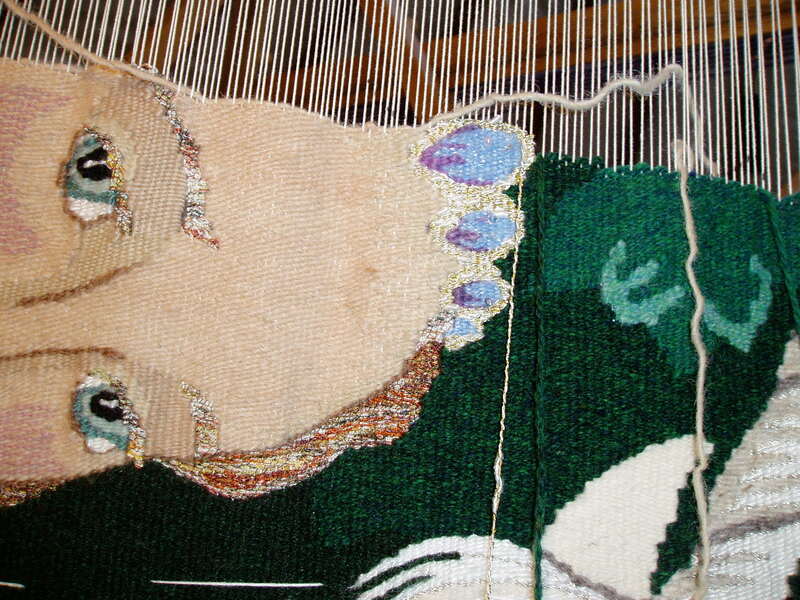 I did specifically make the choice to set the tapestry on its right side on the loom (instead of the left, as is more historically common) in order to afford more time for the study of faces and development of technique before having to tackle my own. This proved to be a critical choice, having all the workings of the unicorn’s mane and eye under my belt before framing the lady’s delicate hair and eye. But now, as I came back to the work, I needed to continue the face in a way that would make it come alive in a dynamic, realistic way within the constraints of the medium. First, I spent time with my detailed photos from faces in both the Unicorn Tapestry sets. Very subtle uses of color (and sometimes using the same color but weaving them in separate parts to form the tiniest of lines through the natural shadows that occur between loops in slit weaving) were employed to bring out the highlights of a face. When preparing for this piece, I was surprised how difficult it was to find convincing flesh tones in yarn. Eventually, I found a variegated alpaca to augment my two main wool colors, breaking the skein apart where the colors began to shift from one subtle tone to another and laying out all the chunks as a gradient palate. This gave me seven colors to use for the face shading, along with three tones for the mouth and cheeks. In the original tapestry sets, alpaca would not have been available as a fiber, though silk was readily employed. 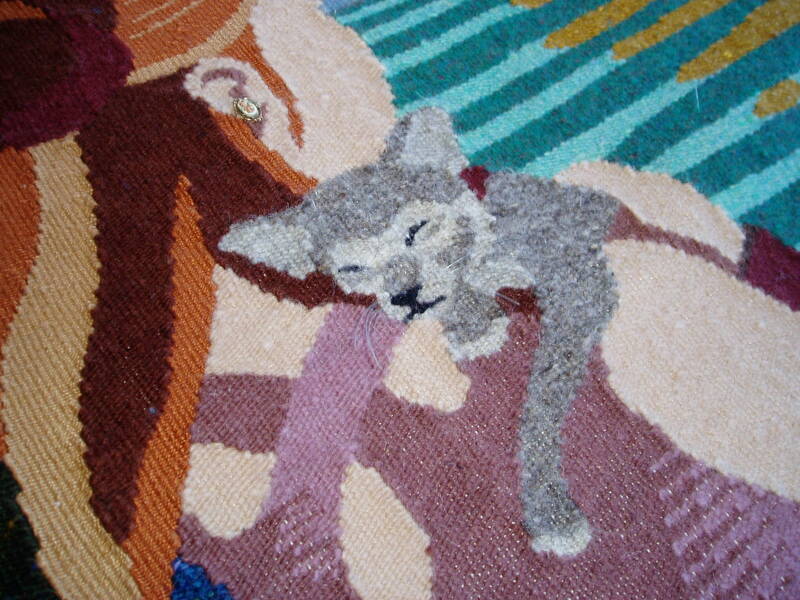 In another post, I will detail the types of fibers I used in this tapestry, their origins, and reason for selection. Some of these are novelty yarns that are not easy to weave in tapestry but offer a specific desired effect, such as the metallic threads in the mane and the lady’s gown and the “Origami” yarn used in her hair, eyelashes, and eyebrows. For her eyes, two tones of green (taking my cue from details of the originals) offer depth and dimensonality. Layers of short two-rows in the cheeks (what in Navajo would be called “wavy line”) of the rose tone, while purposely allowing the weaving to build up in a gentle hill, creates the visual blend and subtle shaping to help color her face. Dustier tones enhance around the nose and above the eyes, while a lighter color brings out the eyelids. It is no longer popular in art to show the eyelids of ladies. Instead, it is much more common to see them portrayed as neo-natal, with huge eyes, darkened around the edges to obscure any hint of eyelid. This was not so in the late medieval/early Renaissance period. Faces were often portrayed as quite pale, and eyelids offered ladies a look of demure demeanor. Even when she is looking a little upwards (as shown here in “Taste” from The Lady and the Unicorn), eyelids are certainly present. But if the lady in “Deceiving the Hunters” is ready to offer an alternative to the traditional narrative of the unicorn hunt, demurity is likely not her prominent characteristic. So the eyelids are present but not overpowering–a nod in both cultural directions. The other reason it was prudent to weave the lady after the unicorn came in the influence of choices in her headdress. Originally, I had colored the jewels framing her face in green on the cartoon (to accentuate her eyes), but the more I studied tapestries of the era, the more I noticed that green jewels are not portrayed, even though green thread was readily available. Rubies, sapphires, diamonds, and pearls predominate almost exclusively. Perhaps sapphires were not as highly prized in this era? Also, as the dominance of the green in the background became apparent, I was concerned that weaving green jewels would simply cause them to visually disappear. Because of the dominance of red tones in her velvet gown, I felt led to lean towards blue gems, then realized that I had but recently purchased a novelty yarn in a soft blue that had beads and sequins spun into it at intervals. This caught my curiosity, since I had already purchased freshwater pearls to stitch onto her gown and was using novelty gilt threads. This would be yet another way to add sparkle and shine to the preciousness of her headdress. And so, not only had I successfully tackled the hardest part of this tapestry, I had also adventured on my first major departing from the original cartoon. Surely, there will be more adventures ahead as the weaving continues and this nearly seven-year project nears completion!